An IL-18 plane belonging to the Russian defence ministry has crash-landed in Siberia, injuring 38 people. Weather conditions were poor and reports said the plane may have been hit by a strong crosswind. The plane was carrying 39 people from the town of Kansk in the Krasnoyarsk Krai region when it went down north-west of Tiksi in the Sakha region. The defence ministry corrected earlier reports that many were killed and said everyone on board had survived. The plane went down in an unpopulated area 29km (19 miles) from Tiksi. Although a strong crosswind was cited as a possible cause of the crash, pilot error was not being ruled out. Thirty-eight people were taken to hospital, Ria Novosti reported. Four were critically injured and the rest were in a serious condition. It was not clear if the last person on board had been rescued. Officials in Sakha said special hydraulic shears had been used at the scene to prise apart the wreckage in the search for survivors. The plane, on a scheduled flight from Kansk, broke into three pieces as it made an emergency landing. Helicopters were sent to the scene to airlift the wounded to hospital in Tiksi. The rescue operation had been complicated by blizzard conditions, with winds of 15-20m/second, Sakha officials said. 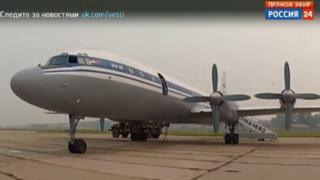 The Il-18 dates back to the 1960s and is still used as a military transporter.